Champion sire of sires Redoute’s Choice is in the spotlight again with his latest flyer Lankan Rupee. The Mick Price trained gelding is favoured to complete the G1 Oakleigh Plate — G1 Newmarket Hcp double next Saturday. Redoute’s Choice has now been represented by 24 Group 1 winners and, apart from Lankan Rupee, he also sired Snitzel to win the 2006 Oakleigh Plate. And with the focus on speed, it’s timely to reflect on Master Of Design who remains the fastest son of Redoute’s Choice at the elite level. Among his first foals is a ripper filly from Group 1 placed Dehere mare Hidden Energy. The dam is a half-sister to Swettenham stallion Kaphero and Flemington stakes winner Princesa. A splendid physical specimen, Master Of Design was originally purchased for $2.10 million by Sheikh Mohammed at the Inglis Easter yearling sale. He won the G1 T J Smith (1200m) at Randwick and the winning time of 1.08.83s has only ever been bettered by Black Caviar! Northern Cath winning at Sandown. Photo compliments of Slickpix. 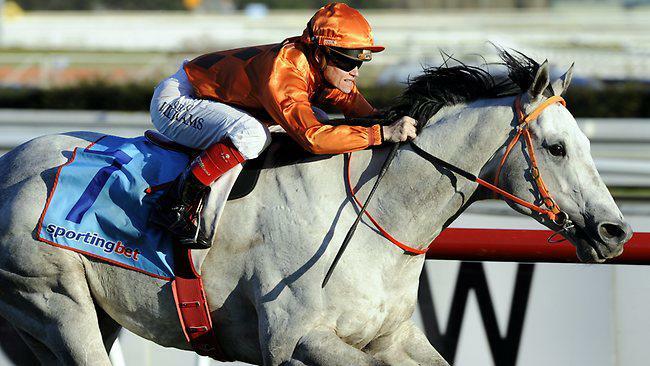 The team behind star stayer Puissance De Lune have unearthed another promising galloper in Melbourne. Northern Cath looked a filly with a future during a four-length dismissal of her rivals in the Cable Beach Club Resort Maiden (1400m) at Sandown on Wednesday. The Desert King filly is trained by Darren Weir for Limerick Lane owner Gerry Ryan. Northern Cath (3f Desert King — Southern Bound by Fasliyev) had been placed at Warrnambool and Moonee Valley prior to landing her first win around the Lakeside circuit. She was bred by the late David Medbury and is a half-sister to Cash Bound (Dash For Cash) who won four races for Ryan and Weir. He was also Group 3 placed in the 2011 SA Sires’ Produce Stakes. Lauriston Park studmaster Chris Bakker stands Desert King at his Creighton’s Creek property south-west of Euroa. Northern Cath’s breakthrough came shortly after Ryan and Weir confirmed Puissance De Lune will be given every chance to resume racing in time for a spring campaign. Ryan part-owned 2010 Melbourne Cup winner Americain and Puissance De Lune was a clear-cut favourite for the 2013 Melbourne Cup before injury intervened. CEPA is a wholly member owned Co-operative, operating in regional Victoria for over 50 years, supplying Stockfeed, Animal Health Products and General Farm Merchandise primarily to the Equine industry.Â CEPA includes many of Victoria’s finest thoroughbred farms as members and has a reputation for service and support that is well known and second to none. 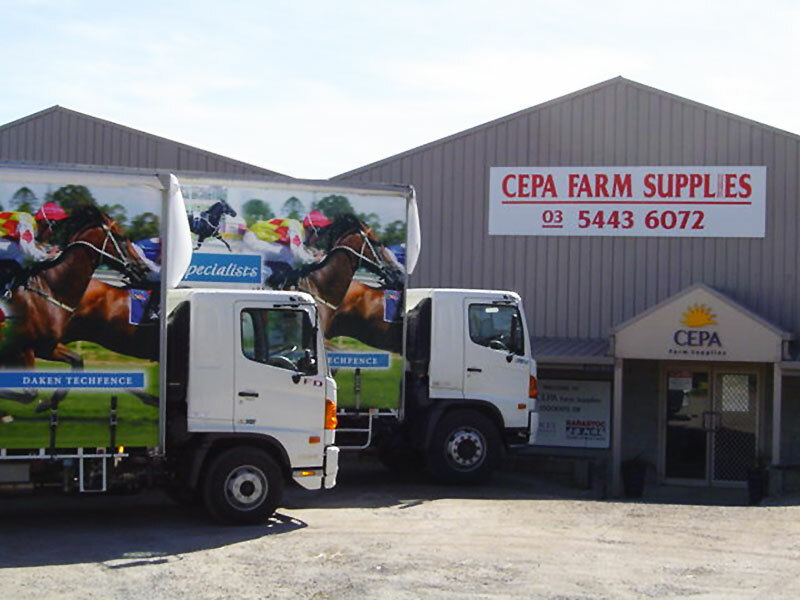 With a successful history of support for the thoroughbred breeding industry, primarily in Victoria’s Central and North East regions, CEPA has entered into this arrangement with TBV with the aim of providing support to the industry that has supported the growth of the Co-operative over the past 9 years, through group buying power, dedicated and targeted service, additional member benefits (such as discounts and free delivery) and increasing awareness and activity over a wider area of Victoria. Benefits for TBV members will be two fold, being firstly for individual members and secondly for the peak industry body itself, thus endeavouring to improve member’s individual daily operations and at the same time enhance TBV’s ethos of representing, promoting and advancing the interests of the thoroughbred and its breeders. CEPA Co-operative Limited is ideally situated in the centre of Victoria (Bendigo), has over 850 members, well established and owned premises, all new and owned plant and equipment, strong manufacturer and wholesale supplier support and a dedicated team of employees. CEPA is a true Co-operative with a strong ethos and focus on service and benefits for members, and not profit. Information, testimonials, and further advice regarding the partnership and how you will benefit and at the same time support TBV, will be offered to you via personal contact to be made with you in due course, by the CEO of CEPA Co-operative Limited, Mr. 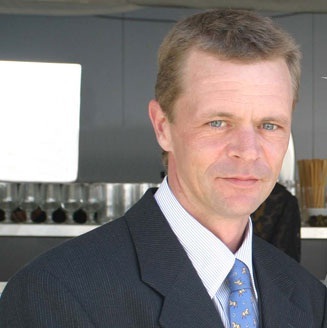 Rob Bogumil, or by contacting the TBV Executive Officer, Ms. Ashleigh Mitchell (tbv@racingvictori.net.au) if you would like contact to be expedited. We look forward to providing the service and support you expect in a practical, reliable, cost effective and professional manner and at the same time supporting Thoroughbred Breeders Victoria. Eliza Park champion Bel Esprit charged through 100 winners for the season on the weekend. All four of his winners were scoring for the first-time since August 1. River Spirit (Gold Coast) & Bel Seal (Wodonga) were successful on Saturday while Bellbrae (Yea) and Billy Esprit (Kilmore) saluted on Sunday. 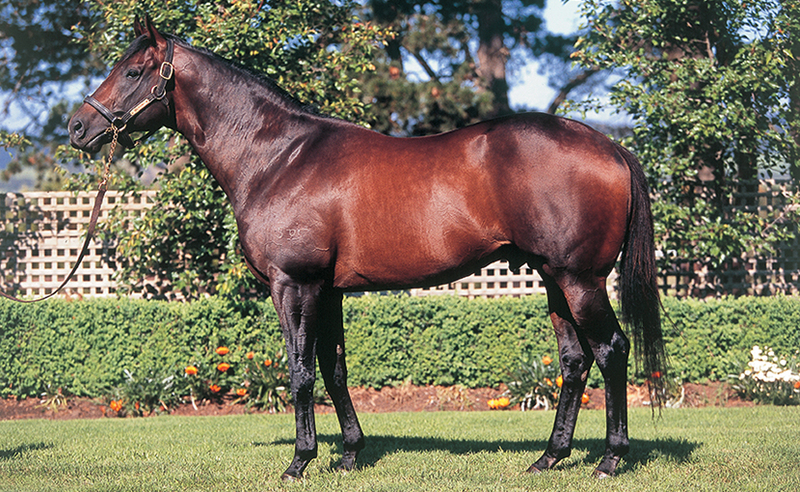 Bel Esprit is the second sire to break the century mark for individual winners this season following Lonhro. He has 14 yearlings nominated for the Inglis Melbourne Premier Sale next week from a wide range of vendors. There are four on account of Eliza Park including the grey colt out of Midnight Sun (Lot 385). He is being sold on behalf of Dorrington Farm owner Rob Crabtree and is related to Bel Esprit’s world champion mare Black Caviar. Midnight Sun (Western Symphony) won four races up to 2400m including the LR Winter Cup in Sydney. She is a half-sister to the dam of Eliza Park’s Group 1 winning sire Magnus and Helsinge who is the dam of Black Caviar and All Too Hard. Regally bred Rodway broke through for his first win on Sunday in the Mitchell Shire Maiden Plate (1600m) at Kilmore. 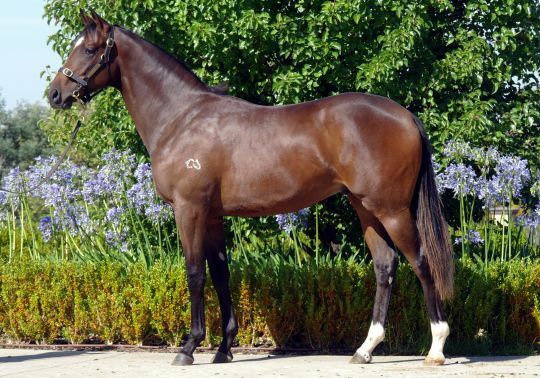 Rodway (3g Street Cry — Tugela by Riverman) is a half-brother to Makybe Diva and he was resuming after a 24 week spell for a large syndicate that includes Makybe owners Tony and Deslee Santic. The Peter Moody trained three year-old had been gelded after two unplaced runs earlier this season. He tracked speedy filly Magdalena’s Rose (Encosta De Lago) first-up and then cleared out to score by nearly five lengths. Tugela has an unnamed 2yo filly by Desert King and she is in foal to All Too Hard. 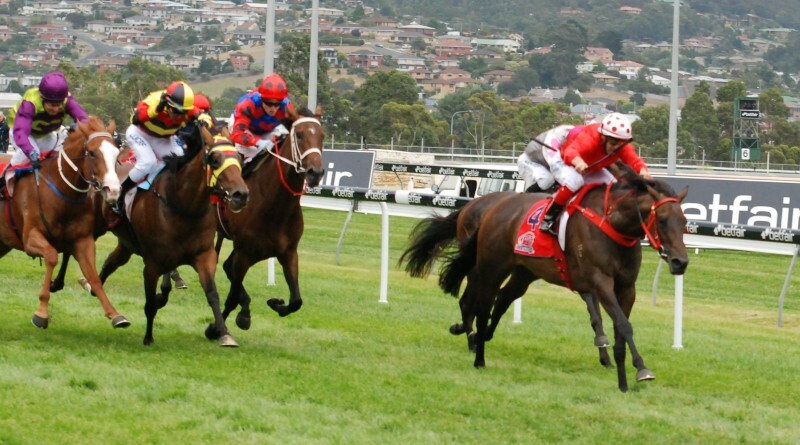 Makybe homebred Tansy was another promising winner for the Santics last week. He had won a Stony Creek maiden by 7 lengths in January and doubled up in the at Sandown last Wednesday. Tansy (3g Purrealist – Our Sistine Peintre Celebre) is a half-brother to stakes-winner Vatican (God’s Own) and has now won two of his four starts for trainer Byron Cozamanis. Purrealist began his stud career at Makybe before transferring to Chatswood Stud. Tansy’s dam Our Sistine is a half-sister to NZ Horse of the Year King’s Chapel. Makybe will offer Tansy’s half-sister by Stryker at the Inglis Premier Yearling Sale through Yallambee Stud’s draft as Lot 447. 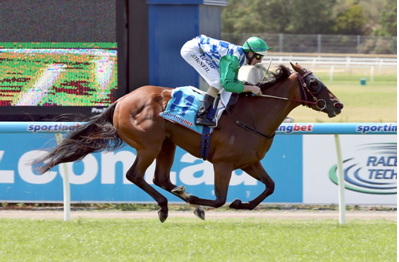 As a winner on some of Australian racing’s biggest stages, Rightfully Yours has provided plenty of thrills for connections but few of his victories have come with the same emotion that followed his Newcomer win at Barastoc Horse of the Year 2014. The former Mick Price-trained gelding’s success in the Ego Sunsense Newcomer Show Horse class was justification for owner Susan Gorst who had persisted with a show career for Rightfully Yours, a favourite horse of her late husband Peter. “He was raced by my late husband who passed away just on 12 months ago and the horse was always going to stay with us,” Gorst said. “He was one of Peter’s favourite horses and we travelled around following the horse and had a lot of fun with the family and the other owners. The popular son of Show A Heart won 10 races in a 32 start career on the track and collected more than $550,000 in prizemoney for connections. Under the care of astute Caulfield horseman Mick Price, Rightfully Yours’ feature victories included the Group 3 Carlyon Cup (1400m), the Listed Hocking Stuart South Yarra Stakes (1200m) and the Listed Clamms Seafood Stakes (1100m), all at Caulfield. Despite initial concern about how the horse would handle the transition away from racing, Rightfully Yours silenced any doubters with a faultless display for rider Mark Kenzig at the weekend event, a class in which 86% of competitors were partnering off the track thoroughbreds. “As a racehorse he was a very strong trackworker and people didn’t think I would be able to hack him once he finished racing because he ran on a lot of adrenaline,” Gorst said. “He had six months out at Monomeith Stud where he was used as a babysitter with the yearlings and he came home to me in May 2012. “I had him at home for a while and he was just a very energetic horse and I thought I wasn’t getting anywhere with him so I rang Caroline Price, Mick Price’s wife, and asked if I could send him down for a week while I was away to see what she thought of him. Gorst turned to Wangaratta horsewoman Sonja Ledger and esteemed show rider Mark Kenzig for assistance, a masterstroke that has seen the horse graduate from a gifted talent on the track to a rising star in the show ring. “Caroline asked Sonja Ledger to take him on and she just hacked him around and took him on bush rides and finally he decided to become a bit more relaxed,” Gorst said. “After Peter became ill I knew that I wouldn’t have time for the horse so I rang Mark Kenzig and asked if he would take him for me and he picked him up on the way home from Barastoc last year and took him back to Sydney. “He had him for 12 months and took him to his first show in November last year. “Mark just understands thoroughbreds because of his racing background and he has just been marvellous with him and hasn’t rushed him. Rightfully Yours’ win was one of a number of highlights for retired racehorses at the weekend’s feature event with Abby Heffer’s Moscow Ballet mare Pink I Am ensuring a Newcomer clean sweep by taking out Champion Newcomer Show Hunter Horse. The win continued the scintillating form of the teenage rider and the iconic grey mare this season and followed success at the VAS Victorian Saddle Horse Championship and the Royal Melbourne Horse Show earlier this year. Over 130 Off the Track Thoroughbreds are set to star on the polo field in last weekend’s coveted Ballarat Cup. Speed, stamina and adaptability, three common attributes of the Off the Track thoroughbred will be on display in regional Victoria this weekend when a collection of retired gallopers take to the polo field for the coveted Ballarat Cup. The weekend’s event is one of the most popular on the Victorian polo circuit, approximately half of the expected 270 competing horses arrive with some history on the racetrack. Hosting the annual event was the Yaloak Polo Club whose Captain, Greg Keyte, and daughter Kelly Fernandez, will be among those to partner an off the track thoroughbred. Greg, an internationally-recognised polo player with decades of experience, rides Tailings mare Ying Yang while daughter Kelly partners another seasoned mare, Extra. Ying Yang, raced as Gonnagetcha by Victorian trainer Jacquie Joiner, was unplaced in four starts on provincial tracks while Extra, bred for a career in racing, has a blank form card. Despite their modest racing record, the pair have displayed gifted ability in a sport both Keyte and Fernandez believe their unassuming, more agile frames are suited to. “The best polo horses are nimble and fast, obviously they have to run as fast as they can and be able to stop and turn pretty quickly,” Fernandez said. “It’s a very physically demanding game and you need a horse that can stand up to that, which thoroughbreds typically can. Greg added that his mount Ying Yang, already well recognised within the polo community, was a perfect example of a thoroughbred that, given time to learn the sport, could make an ideal mount for high level competition. Saturday’s event which kicked off at 11am at the Yaloak Polo Club in Ballan, saw approximately 1500 spectators turn up to watch some of Australia’s leading talents battle it out for the coveted prize. Bookmakers have firmed Hucklebuck into a $6 favourite for the Group 1 Australian Guineas (1600m) at Flemington on March 1. The son of Blue Gum Farm stallion Elvstroem was a dominant winner of the C S Hayes Stakes (1400m) at headquarters on Saturday. Hucklebuck (3g Elvstroem — Kondari by O’Reilly) pushed his way out of a pocket and then put a gap on his rivals to win by almost two lengths from Prince Harada (Haradasun) and The Quarterback (Street Boss). Hucklebuck won his first two starts at Gawler and Morphettville before an unlucky third to Lion Of Belfort at Moonee Valley last September. 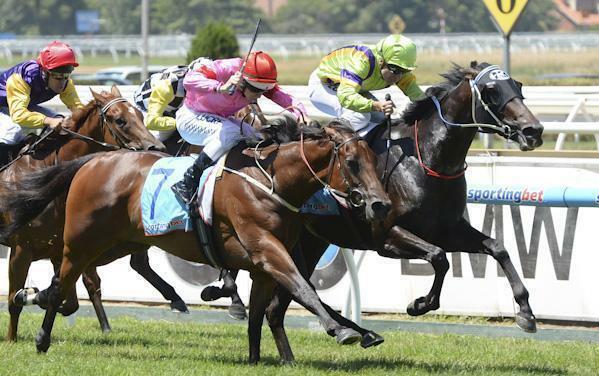 He came back to Melbourne for a second interstate trip a month later and compensated connections with a Group 3 victory in the Gothic Stakes at Caulfield. Stokes trains Hucklebuck and fellow Group 3 winner Eclair Big Bang for Macau owner Thomas Li and cost $50,000 at the 2012 Adelaide Magic Millions. His dam Kondari is a half-sister to the dam of G3 SA Sires’ Produce Stakes winner Stirling Grove (Mossman). Elvstroem (Danehill) has now sired 11 stakes winner since Carrara opened his black-type account in the 2009 Doomben Slipper. His latest came courtesy of Outback Joe and owner-breeders Denis and Margaret Marks of the Seven Creeks Estate Syndicate. Outback Joe is from champion mare Let’s Elope and he won the VRC Bagot Handicap on New Year’s Day. Elvstroem stands at Blue Gum Farm alongside Canford Cliffs (Tagula), Turffontein (Johannesburg) and Red Arrow (Red Ransom). Hard Spun filly Spinning Jenny will be set for mainland classics after winning the LR Strutt Stakes (2100m) at Hobart on Friday. Spinning Jenny (3f Hard Spun – Suraya by Brief Truce) was bred by Rick Jamieson of Black Caviar fame at Gilgai Farm in Nagambie and is the 24th stakes winner for Darley Victoria stallion Hard Spun. The Brendan McShane trained filly kicked clear in the straight and was still going strongly on the line to defeat Iggimacool (Savoire Vivre) and Geegees Velvet (Wordsmith). “This was always the plan and we kept something in the tank for this race,” McShane said. “When they postponed from last Sunday, we took her down to the track on Tuesday and she worked brilliantly. McShane won the Strutt Stakes as an apprentice on Someos in 1986. She was trained his father Walter and was a homebred by their sire Virginia Gentleman (Crocket). Spinning Jenny was a bargain $8,000 buy from the Gilgai Farm draft at the 2011 Inglis Great Southern Foal Sale. She is from a half-sister to Melbourne winner Philda (Secret Savings) and the dam of G2 winner Philippi (Host). Hard Spun (Danzig) will be represented by 6 yearlings at the coming Melbourne Premier Sale and another 8 for the Melbourne VOBIS Gold Sale in April. 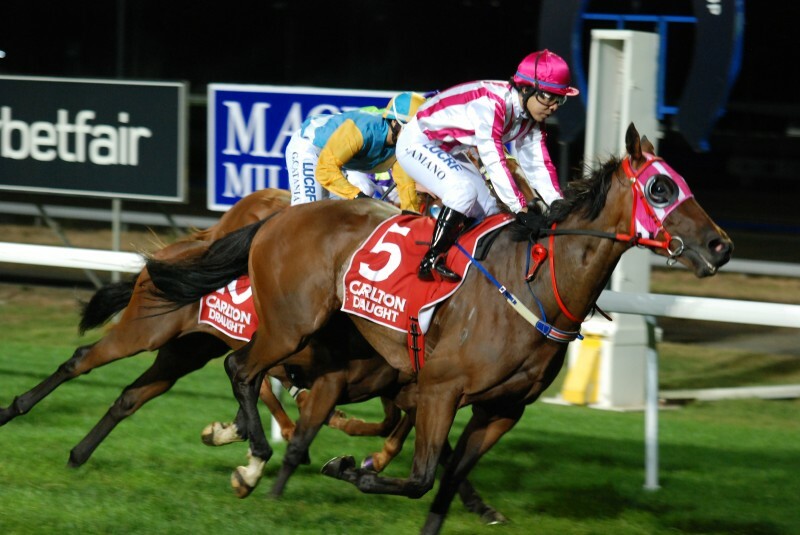 Keep The Cash is guaranteed a start in the Launceston Cup after his victory in the Carlton Draught Night Cup (2100m). The Brendan McShane trained gelding had been a shade disappointing at recent starts but produced his best on Wednesday evening. Keep The Cash (4g Keep The Faith — Cash Stash by Dash For Cash) was given a perfect run, sitting in third place, by Shuji Amano before finishing strongly to score a comfortable win over Hobart Guineas winner Moonless and Devonport Cup winner Red Eagle. Despite the victory, McShane said the gelding isn’t a certain starter in the 150th running of the G3 Launceston Cup (2400m) worth $225,000 on Wednesday, February 26. Keep The Cash is by Greta West Stud sire Keep The Faith and is bred to get to get over ground being closely related to 1999 G1 Zealand Derby winner So Casual (Casual Lies). James Cummings is confident Brook Road has enough potential to bridge the gap between a midweek win and a Saturday stakes race. The God’s Own filly was a cut above older mares at Randwick on Wednesday and that was confirmed when she clocked a class record 1.06.72s in the Lynne McLean Hcp (1150m). Cummings said the filly holds a nomination for the G1 Australian Guineas (1600m) in Melbourne but the preferred options for her next start are the G2 Light Fingers Stakes (1200m) or the G2 Surround Stakes (1400m). Bart races Brook Road with long-time stable supporter Laurie Kern. He also bred the filly and her older sister Rosscarbery who won three races for the same partnership. Jockey James McDonald is keen to stay aboard after her second win in a row on the Kensington circuit. “I like her — she’s a dynamic filly,” he said. “She went super first-up and really attacked the line again today. Bart trained God’s Own to a Group 1 Caulfield Guineas victory and, since relocating to Greta West Stud last year, he has gone from strength to strength. 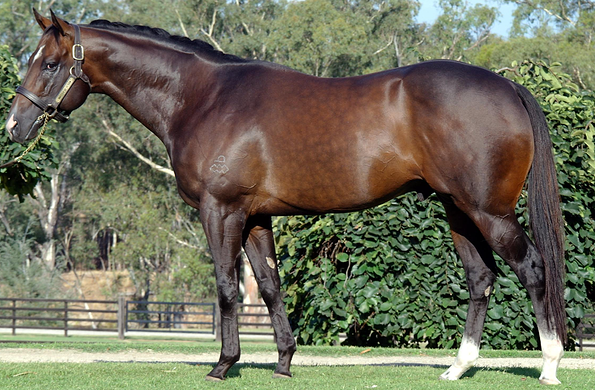 God’s Own (Redoute’s Choice) is an Australian Top 15 stallion in the wins category with 88 to February 12. He is second behind Bel Esprit (122) among Victorian based sires and is pulling clear of Reset (82), Magnus (77) and Elvstroem (71). Prominent South African owner Markus Jooste was a Top 5 buyer at the 2013 Inglis Melbourne Premier Sale but it was one of his bargains that bolted in at Clairwood on Sunday. Rich Girl (2f Rock of Gibraltar — Miss Moguls by Giant’s Causeway) cost Jooste just $11,000 out of the Chatswood Stud draft at Oaklands Junction. She had finished second on debut last month and followed up with a five length runaway in the Maiden Juvenile Plate (1000m) down the straight course at Clairwood. Miss Moguls is a half-sister to the dam Rock of Gibraltar filly Tariks, a juvenile stakes performer at Flemington and Cheltenham. Another precocious filly in the family is Catnipped (Rory’s Jester) who won a G2 Maribyrnong Plate and Magic Millions Classic. Chatswood Stud sold Miss Moguls for a mere $600 at last year’s Inglis Great Southern Sale. 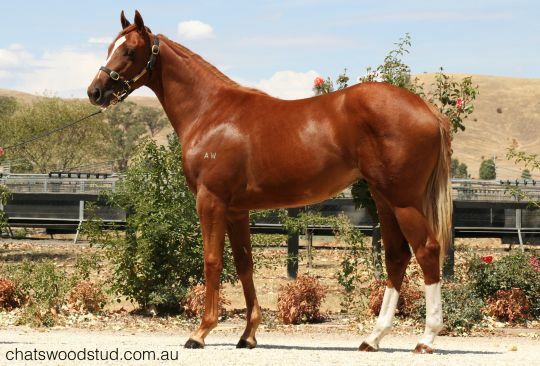 She was purchased by Balnarring based John Ferguson of Kineld Thoroughbreds. Ferguson bred two Group 2 winners last year — Escado (Casino Prince) in the SAJC Derby and Se Sauver (Bel Esprit) in the VRC Edward Manifold Stakes. He mated Miss Moguls with Cherokee Rose Stud stallion Floral Pegasus (FuPeg) in September. Blingo (5g Artie Schiller — Wassifa by Sure Blade) races for the owner-trainer team of Jerry Moss and John Sherriffs who guided the career of celebrated mare Zenyatta. 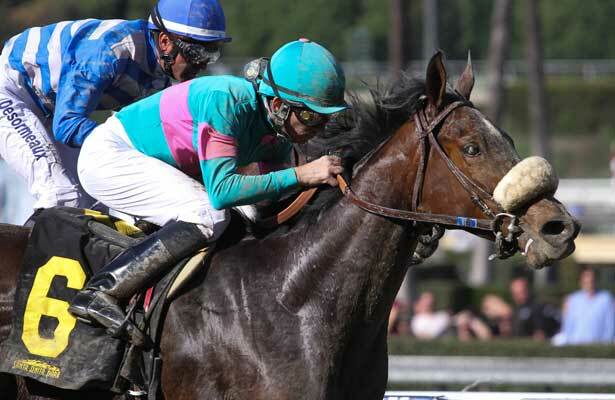 It was his third black-type victory following the 2012 La Puente Stakes at Santa Anita and 2013 I’m a Banker Stakes at Belmont. Blingo started 16/1 in a race dominated by $5 million earner Game On Dude who was seeking an unprecedented third San Antonio success. The odds-on favourite employed cut-throat tactics alongside Blueskiesnrainbows and Imperative and was a sitting shot when Blingo advanced with a strong bid turning for home. Blingo was bred in Kentucky and sold for $80,000 at the 2010 Keeneland September yearling sale. His dam Wassifa has also foaled fellow stakes-winner Hold to Ransom and the dam of G2 winner Prince Bishop and G3 winner Retrieve. 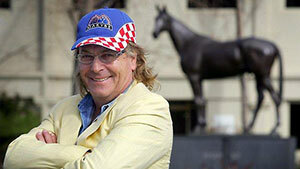 Artie Schiller (El Prado) sired 11 individual black-type winners in 2013. He just missed a black-type double on Saturday when Sonny Inspired was beaten a nose in the LR Christopher Elser Memorial (1300m) in Philadelphia. Emirates Park has catalogued 6 Artie Schillers among a total of 19 yearlings by him being offered at the Inglis Melbourne Premier Sale in March. The son of Swettenham Stud sire Dash For Cash refused to surrender during a thrilling duel with Star Rolling. Winning jockey Craig Williams lifted the grey stallion over the line for his first black-type victory since the G2 MVRC Bill Stutt Stakes in September 2011. Chase The Rainbow (5h Dash For Cash — Illusional by Redoute’s Choice) has won 5 races from just 11 starts for part-owner and trainer Rick Hore-Lacy. He was a $90,000 buy from the Swettenham draft at the 2010 Inglis Melbourne Premier yearling sale and has now earned $440,000. “What a gutsy horse,” Hore-Lacy beamed. “The other one had him beaten all the way down the straight and he still won. Hore-Lacy trained Dash For Cash to Group 1 victories in the Australian Guineas and Futurity Stakes. And he prepared damsire Redoute’s Choice to Group 1 triumphs in the Blue Diamond and Caulfield Guineas. Chase The Rainbow is an older half-brother to G2 Karrakatta Plate winner Ms Funovits (Reset). Their dam Illusional is owned by Victorian-based breeder Robert Hance who trades under the North Road Bloodstock banner. Illusional foaled a filly by Dash For Cash in November and Hance bred her back to Reset. Swettenham has catalogued four Dash For Cash yearlings for the Melbourne Premier Sale in March including a three-quarter brother to Sydney Group 3 winner Bank Robber (Lot 709) and a three-quarter sister to Adelaide Listed winner Extension Of Time (Lot 735). Spirit’s Dance completed a winning 24 hours for Contract Racing in the G3 Kevin Hayes Stakes at Caulfield on Saturday. It completed a winning hat-trick for the daughter of Eliza Park stallion Statue Of Liberty who has now been represented by 13 stakes winners. He had sired Liberty Leader to a Listed victory in the Tasmanian Derby a week ago. Royal Scandal claimed the first-leg of a city double for Contract Racing in the Sportingbet Hcp (1000m) at Moonee Valley on Friday night. Royal Scandal (4m Hard Spun — Palace Glow by Palace Music) had won races at Pakenham, Ballarat and Mildura last year before the breakthrough in town. She produced a potent final burst to improve her resident value as a broodmare. The Moodies maintain a quality portfolio of mares at Yungaburra Stud north of Mount Macedon to service successful teams at Flemington (Ellerton — Zahra Racing), Peter Moody (Caulfield) and Brent Stanley (Kyneton). Royal Scandal is trained by Stanley and she is from a black-type family that includes her half-brother Red Colossus (G3 MRC Victoria Hcp) and half-sister Nediym’s Glow (G3 MRC Blue Diamond Fillies Prelude). 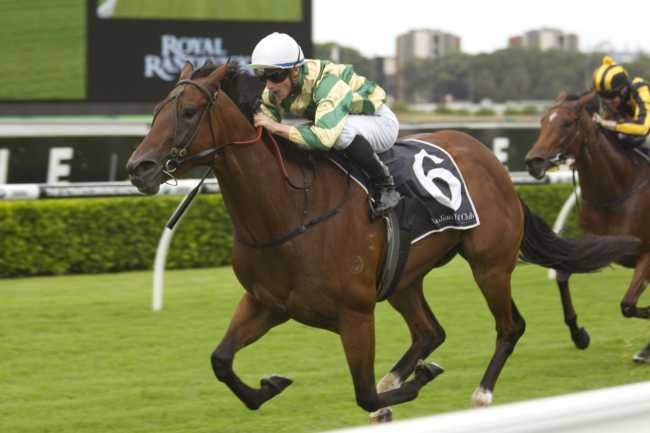 She is a three-quarter sister to Royal Haunt who was a Listed winner of the 2013 Manfred Stakes at Caulfield. He is also by Darley Victoria sire Hard Spun and, after an unbeaten career in Australia, was sold to clients of Hong Kong trainer John Size. Royal Scandal follows Hard Spun gelding Party Talk who is a last-start winner at Werribee for Contract Racing. He is a half-brother to G2 AJC Emancipation Stakes winner Hec Of A Party. Hard Spun added another notch to his second-season winner count when Unspun scored a last-to-first victory in the Members Roast Hcp (1400m) at Morphettville on Saturday. Unspun (3g Hard Spun – Pont Aven by Green Perfume) was part of the Ealing Park draft at the 2012 Inglis Melbourne Autumn yearling sale and made $21,000 to the bid of trainer David Balfour. 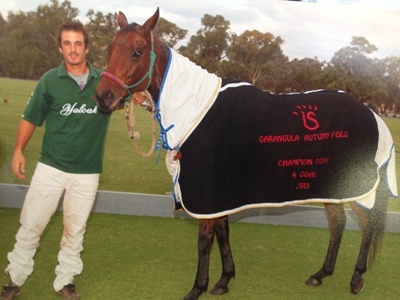 Hard Spun (Danzig) stood for a $16,500 (inc gst) fee at Darley Victoria in 2013. Blue Gum Farm can lodge a last-minute update for its Lonhro — Screen Legend colt at the Inglis Melbourne Premier yearling sale starting on Sunday, March 2. Catalogued as Lot 530 at Oaklands Junction, the colt is from a half-sister to Samraat who will continue his Kentucky Derby campaign in the $500,000 Gotham Stakes on Saturday, March 1. 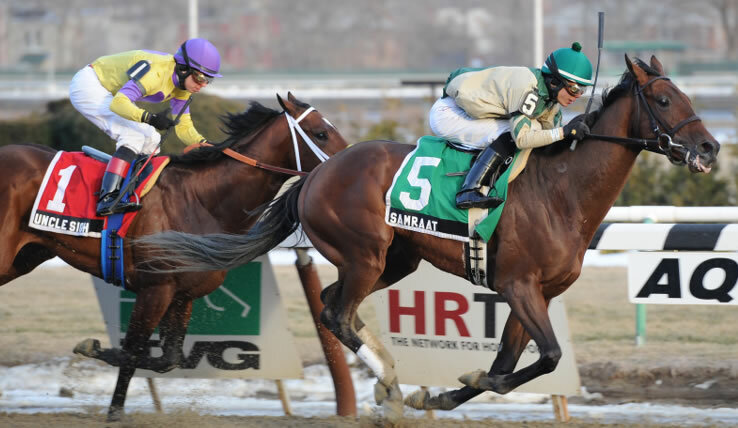 Samraat launched this year’s Run for the Roses with a determined victory in the G3 Withers Stakes at Aqueduct on February 1. He was coming off a 16 length romp in the Damon Runyon Stakes in December. His older half-sister Screen Legend was a juvenile winner over 1600m in USA. The Tiznow mare was also G3 placed in the Lassie Stakes at Arlington. Blue Gum’s Lonhro colt was her first foal after arriving in Australia in February 2011. Samraat (3c Noble Causeway — Little Indian Girl by Indian Charlie) is unbeaten in four starts after winning a duel with Uncle Sigh in the Withers Stakes. The pair separated themselves from the rest of the field by as much as seven lengths before Samraat got the upper hand to score by a length. Samraat, who is a homebred for My Meadowview Farm owner Len Riggio, has earned 10 points on the qualifying leader-board for the Kentucky Derby on May 3. Riggio bought his dam Little Indian Girl for $150,000 at the 2008 Keeneland November Sale. Besides Screen Legend and Samraat she has also foaled Japanese stakes performer Original Fate (Grand Slam). Blue Gum has a 21 strong consignment for the Inglis Melbourne Premier Sale including 6 second-crop yearlings by its resident sire Turffontein. Turffontein (Johannesburg) was a Group 1 winner of the MVRC William Reid Stakes and MRC Sir Rupert Clarke Stakes. 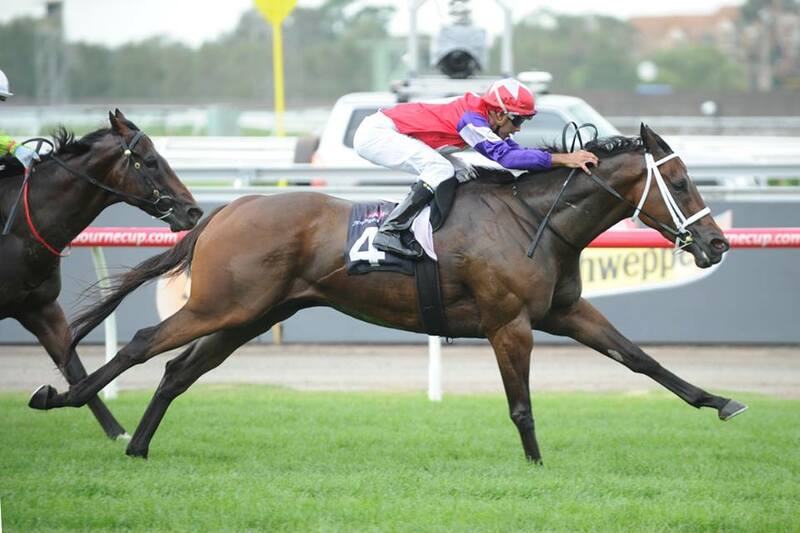 The best of his babies seen out so far this season has been the Tony Vasil-trained filly Fontein Ruby. She was runner-up on debut at Caulfield on Boxing Day and holds a nomination for the LR Inglis Premier at Mornington on Wednesday, February 12. Boys Day Out (2g Domesday — Verkko by Flying Spur) made it a big day out for trainer Gratz Vella and connections on debut. He tracked tearaway leader Perizada (Shaft) and then strode clear for a comprehensive four length victory in the Aristocrat Hcp (1000m). The winner was bred and sold by Tylden based Woodside Park for $15,000 at the Inglis Melbourne Premier II Sale in March 2013. He subsequently changed hands again for $38,000 when offered by Edmonds Racing (as agent) at the Inglis Ready 2 Race Sale in October 2013. Boys Day Out is by Darley sire Domesday and his dam Verkko won a Mortlake maiden in 12 starts for erstwhile Woodside Park trainer Dale Sutton. Second dam Sybarite (Last Tycoon) is a half-sister to Champion South African filly Laisserfaire and the Australian stakes winning stallions Foreplay and Time Thief. Verkko has a yearling filly by former Woodside stallion Econsul (NZ) who is now based at Darling View Thoroughbreds in Western Australia. The mare was served by Written Tycoon last year. Woodside Park has 6 colts catalogued for the Inglis Melbourne Premier yearling sale in March. After watching his former Group 1 winner Maldivian steal the show at today’s Relaxed Racing media launch at Caulfield, leading trainer Mark Kavanagh has described the satisfaction he gets from seeing his retired stars enjoying retirement. Maldivian returned to Caulfield, the scene of his 2009 Group 1 C.F. 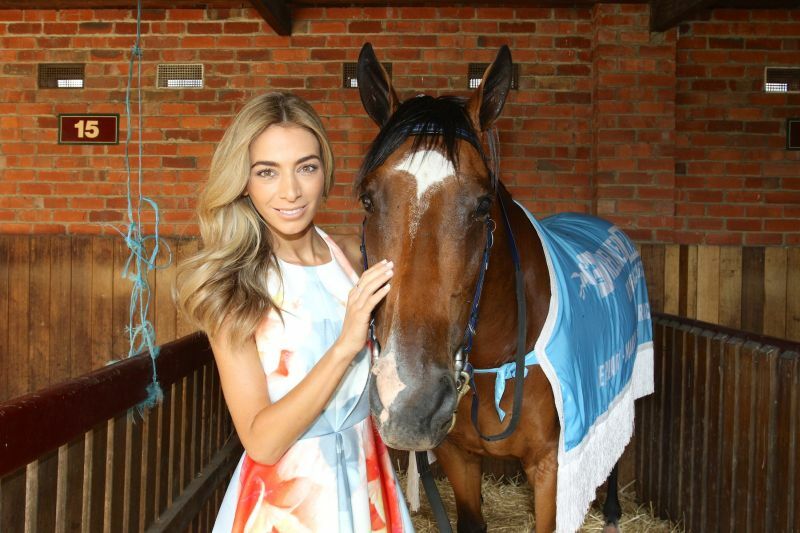 Orr Stakes victory, arriving with Rugby League star Billy Slater in the saddle for the launch of Victorian racing’s exciting new marketing campaign, Relaxed Racing. A winner of three Group 1 races and close to $3 million in prizemoney during a distinguished career on the track, 11-year-old Maldivian now spends his days overseeing the development of young horses at Kavanagh’s Gisborne property. “This old horse is just a star,” Kavanagh said. Click here to watch highlights of today’s Relaxed Racing Media Launch. Kavanagh said he took an active interest in the post-racing careers of his horses and praised programs like Racing Victoria’s Off The Track initiative that offer thoroughbreds the chance to showcase their talents in different disciplines. “We make sure that, through Off The Track or other avenues, we find somewhere good for our horses to live,” Kavanagh said. Another of Kavanagh’s former Stakes winners kicking goals since leaving his stable is Fusaichi Pegasus gelding Tipungwuti, now a highly promising eventer for young rider Andrew Heseltine. The Flemington trainer said Tipungwuti has given him the indication that he would be suited to a multi-disciplined event career and said he wasn’t surprised that the horse is being touted as a future star. “Tipungwuti was one of the most talented horses I’ve ever trained and he was an extremely nimble horse who deserved a really good home because I thought he would go that way (eventing) and be able to do that,” Kavanagh said.